Ready To Throw Your Drivers License Away? Google Driverless Car Is Here! Home Drivers License Ready To Throw Your Drivers License Away? Google Driverless Car Is Here! 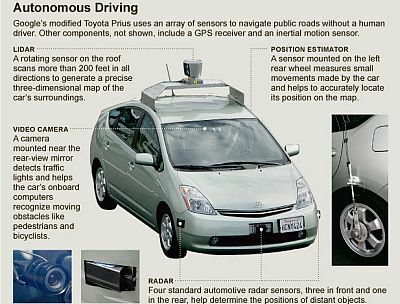 Google is working on the invention that will literally change the world - a car that does not require a driver. While the possibility has been drooled over by sci-fi fans around the world for a few decades now, no one has ever come even close to building a prototype that was ready for on-road trials. Most of the projects that were introduced by car manufacturers required a whole new infrastructure to be built: new roads, guiding systems, positioning systems, etc. Google went another way and fit all those things into a mass-produced vehicle. Better yet - Google driverless car has already undergone extensive trials, on a racing track and even on real public roads. The government in Nevada and California are working with Google on adjusting the legislative system to this new possibility and Nevada already licenses driverless cars. So, are you ready to finally throw your drivers license away? While the details of the system behind this amazing car are kept in secret, Google states that the guiding system utilizes a $70,000 laser radar system (LADAR) with a 65-beam laser, a bunch of cameras, a radar, a GPS navigator, data from various mapping packages and the state of art software that brings it all together. The video cameras are constantly watching for traffic lights and moving objects, radars are checking for other cars around the vehicle and the LADAR is used to build a three dimensional image of everything that surrounds the vehicle. 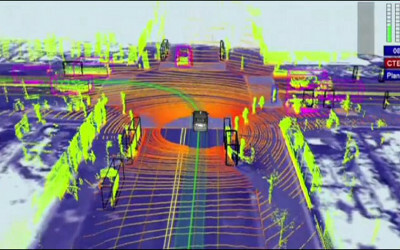 This is how the driverless vehicle “sees” our world. The price of the equipment alone is around $150,000 while much more substantial funds are being invested into developing the technology that will allow such cars to be operated on public roads. There are many reasons to switch to Google driversless cars and safety is probably one of the most important ones. While it may be hard for us to relinquish control to a machine, we have to admit that machines do many things much better than us humans. Car manufacturers have been delegating certain driving tasks to machines for a while now: many modern cars have auto-park system that can parallel-park your car, there are safety systems that will stop the vehicle before you rear-end the car in front of you, almost every car today has traction control, ABS and many other small systems that make driving a bit easier. Google just made the next logical step - giving full power to the machine, the machine that can see trouble before you do and react to that trouble accordingly. Google is expecting driverless cars to reduce the number of accidents by 99%! If they stand up to the promise, it will mean that the driversless car is the most effective safety system invented since the first car was built! The invention of a driversless car will change the world and its economy. The world automotive industry is huge, the States alone generate about $600 billion in car sales every every year, another $200 billion is spent on car insurance. Why do you need car insurance if the number of accidents will reduce by 99%? Body shops that fix cars after traffic accidents - gone. Tickets for speeding, running red lights and stop signs, breaking other traffic laws, traffic school courses to clear these tickets - gone. Medical workers who are treating millions of victims of car accidents and pharmaceutical companies that produce drugs for these patients - gone. Fuel consumption reduced dramatically (not even considering the fact that the world is going electric). Less roads need to be built as driverless cars will use the road more effectively. All these industries will be hugely impacted if the driversless car hits the roads. Should You Throw Your Drivers License Away? Now, many people say that they like driving and they don't want a machine to do it for them. While I can see how driving your own car may be banned in 50 years, don't throw your drivers license away just yet. Driverless cars have an option to switch from the automatic mode to the regular car mode, so you can get behind the wheel, hit a button and get in control of your car! However, imagine how great it would be to have the car do your chores for you: drop off the kids at school and then return back home, pick you up from a pub on a late night... All these things will be possible once these cars are mass-produced by car manufacturers. Having said all that - don't throw your driver's license away just yet. Self-driven car by Google will change the world, but it does not mean you still cannot enjoy a ride once in a while and you will need a drivers license for that! If you are looking to obtain a drivers license some time soon, make sure to check out a free practice permit test that we offer on the website. Practice tests is a great way for you to prepare for the real permit test at the DMV, so make sure not to miss out on it!